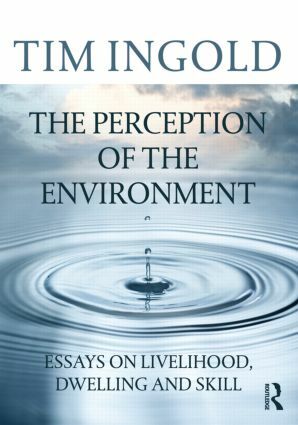 In this work Tim Ingold offers a persuasive approach to understanding how human beings perceive their surroundings. He argues that what we are used to calling cultural variation consists, in the first place, of variations in skill. Neither innate nor acquired, skills are grown, incorporated into the human organism through practice and training in an environment. They are thus as much biological as cultural. The twenty-three essays comprising this book focus in turn on the procurement of livelihood, on what it means to 'dwell', and on the nature of skill, weaving together approaches from social anthropology, ecological psychology, developmental biology and phenomenology in a way that has never been attempted before. The book revolutionises the way we think about what is 'biological' and 'cultural' in humans, about evolution and history, and indeed about what it means for human beings - at once organisms and persons - to inhabit an environment. Reissued with a brand new preface, The Perception of the Environment is essential reading not only for anthropologists but also for biologists, psychologists, archaeologists, geographers and philosophers.